The easter eggs from my previous post were all eggs I had decorated last year, but I when I wanted a few more eggs for my easter tree I decided to try out a new technique: marbling with nail polish and water. My inspiration were these stunning eggs from Alice & Lois that I spotted on Pinterest. They have a full tutorial and lovely process photos on their page, which I recommend checking out. 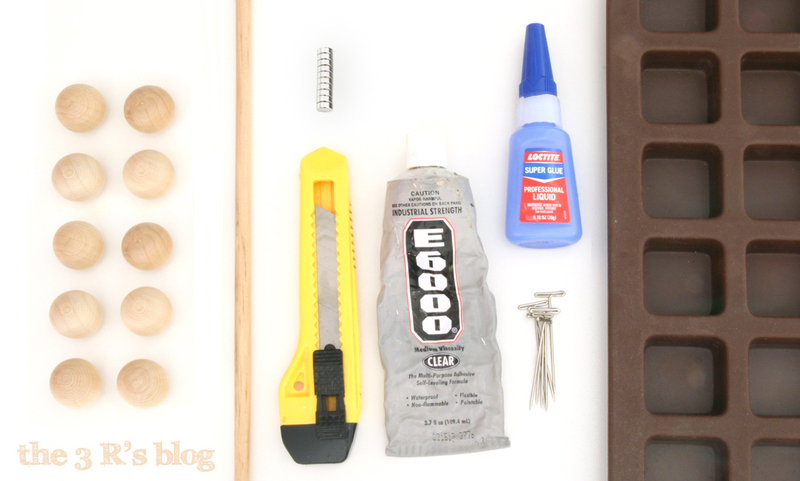 The nuts and bolts are that you drip nail polish into a container of water, swirl it around, and then dip the egg into the polish. I tried two different techniques. If you have eggs you don’t want to eat (I had a few really old eggs) then you can simply drop them into the bin of water raw, and they will sink. Then you blow them out after and discard the egg. The other technique I employed involved blowing out the eggs first, so you can eat the liquid egg. Then I created a sort of egg dipping handle, using a bent paperclip. I had a small bend at one end, and then after sliding the hollow egg onto the paperclip I bent the long end up in the opposite direction to serve as a handle. I could then hold onto the long end and use it to dip the egg down through the nail polish without the hollow egg floating. My first attempts were cool, but had limited marbling and few white areas. I think my problem was too much polish, but also too small a surface area of water. So I tried again with a larger container and while I was able to get more white areas, I was also really struggling with the nail polish forming a film too quickly and then not sticking properly to my eggs. Though I have to say I ended up with some pretty cool finished products, I don’t know if I’d call it ‘marbled’ per se. (See image to left.) I had been using room temperature water like the Alice & Lois tutorial recommended, but with some further research it sounds like hot water might have been better, it might have slowed the polish hardening. After the eggs had dried, I strung them with ribbon to complete the look. When I was blowing the eggs out I made sure to create large holes at both the bottom and the top of the egg, since I knew I was going to be using ribbon. I then used a tapestry needle to thread the ribbon through the egg. For these eggs I threaded the ribbon through the egg from the bottom, and then back down from the top leaving a loop out the top. Then I double knotted the ribbon at the bottom of the egg, and trimmed the ends at an angle. I also had one egg that I had soaked in some red cabbage juice to get a subtle blue tint, and then I dipped it in the polish leftovers after dipping another egg. So the coloring of the final egg was a more subtle blue on blue than the other eggs, but I think it is also really pretty. Here you can see the different sides, it was harder to capture this egg in photos than the others, for some reason. All in all, I’m pretty excited with how these turned out, though I also feel like I have a lot still to learn about this technique. But, the wheels in my head are already spinning with other items I can decorate with some marbled nail polish. I’d love to hear if you have tried this technique and how it worked for you. Last year I was visiting family in Vienna right before Easter, and I loved all the decorations. Every shop and restaurant was decorated with branches strung with hanging Easter eggs. It was positively captivating! And I knew I just had to try and recreate the effect at home. And thus began my experimenting with different egg decorating techniques, some of which I thought I’d share with you today. For all of these designs I used real egg shells, carefully blown and washed. Honestly one of the hardest parts was getting the thread from one side to the other, and in the future I might take some inspiration from the beautiful eggs I saw in Vienna and use a pretty grosgrain ribbon instead. The first set I made were decorated with sharpie, in a variety of patterns and simple drawings. So far I stuck with just white shells, but it might be pretty to incorporate some brown ones too. These eggs are simple to recreate and no fancy supplies necessary, just a clean shell and your favorite sharpie! I love the crisp black and white, but it could look really pretty with some brightly colored grosgrain ribbon too. I am envisioning a whole tree with black and white eggs and a rainbow of different ribbons. Though a simple color palette of pinks and greens could be elegant too. The second design I played around started with a design that would pair well with my sharpie decorated eggs. Shells stamped with alphabet letters! I have a bunch of different sets of letter stamps, mostly purchased from the $1 bin at Michael’s, and so I played around with a few different letter types, plus color combinations. I love the idea of the white on the brown shell, but the white ink I had was a thicker paint-like ink, and it retained a bit of it’s sticky quality which I didn’t like. The black ink I had was from a more traditional harder ink pad, so the ink didn’t have that thick paint-like quality and I like how it looks on the egg shell better. It was certainly fun to play around with the different colors and fonts. Each time I try a new version I like it better than the last. The one problem with the thinner ink was that it was a bit slippery, and every now and then as I tried to stamp the letter my hand would slip slightly and smudge the ink. You can see a couple of smudgy places on these eggs but it doesn’t really ruin the look so it’s not the end of the world. The third design reminds me a bit of one of those snowball deserts with the coconut. I had a bunch of confetti created from scraps of coffee filters both dyed and plain white and I thought it might look fun glued on an egg. I smeared hot glue on the egg shell in small areas at a time, and then just dipped and rolled it in the confetti. It wasn’t what I was expecting but I kind of love it. It’s very ‘snowball coconut dessert’, if you ask me. I then decided to try decoupaging the confetti with mod podge, and again it wasn’t really what I was envisioning but it’s kind of cool. I think next time I might try a much paler pink, the colors all got much more saturated as they bled, and I was envisioning a paler color palette to better match the beautiful quince branches I used as my Easter tree. I hope you enjoy these different decorating options, and if you try any of them for yourself I’d love to see the results! As promised, I have an exciting new project to share with everyone today. Small cement planters that look like crushed plastic cups! Last March I was visiting a close friend in Munich when I spotted a video on Instagram about how to use a crumpled solo cup to make a small cement planter. I showed it to my friend and a day later we were in the German version of Home Depot buying cement. We had so much fun that I knew I just had to try and recreate this project once I got home. I took a bunch of progress photos which I’ll show with the instructions below. But I also tweaked my technique as I went and I didn’t necessarily capture all of my final recommendations in these photos. I’ll make sure to point out when my recommendations differ from what the photos show, and you may need to use your imagination. Cement – I used Cement All by Rapid Set. It’s available on Amazon but a LOT cheaper at a Home Depot or similar store. Plastic Cups – I used 16oz, 12oz and 8oz for various jobs. You’ll need two cups for your mold. I used 16oz cups for the outside, and while I originally used 8oz for the interior (shown in the photos) I found that if you are careful you can use a 12oz and then you have a much larger area for your plant and you use less cement. I am much happier with those planters, and so are my plants! I did make one 8oz planter which is adorable, but tiny and not very practical. Cover the exterior of your large cup in duct tape. This is because when you start squishing and crumpling the cup, it might split or crack. It also helps the plastic to hold the crumple once filled with cement. Crumple your cup. Feel free to really squish it, every wrinkle will add detail to your finished planter and make it look more interesting. Let your cup pop back out to it’s full shape, while retaining the crinkles and indents. 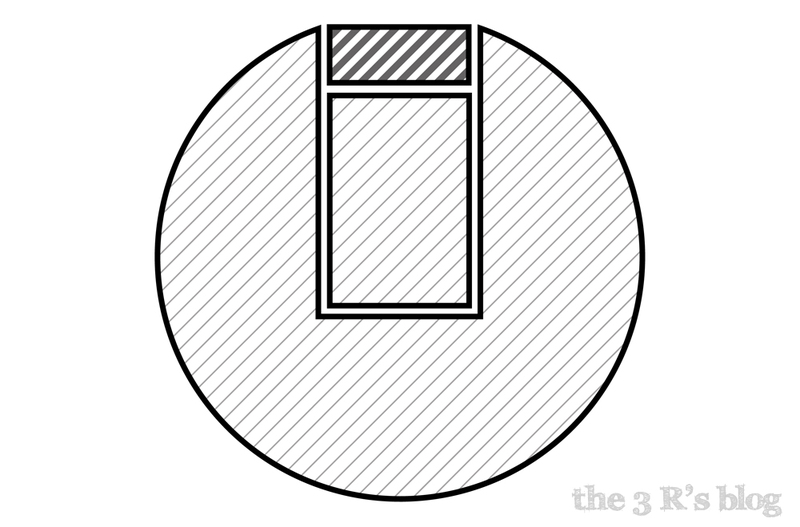 Double check that your interior cup can still fit without hitting any of the sides. This is especially important when you are using the 12oz cup inside. You may need to smooth out some of the larger indents. Put on your latex gloves and start measuring your cement and water. You need 4 parts cement powder to 1 part water. I usually used the large 16oz cups for mixing in, and a smaller 8oz cup for measuring approximate amounts, measuring up to a specific line along the side of the cup. It doesn’t have to be super precise. Start mixing. I found it was easiest to measure the water into my mixing cup first, and then add the cement powder a bit at a time. It will often feel like there’s too much powder but just keep mixing and it will all absorb the water, I promise. Once mixed, pour your cement into your mold. Because we are using plastic cups you don’t need any non-stick layer for the cement to release. Fill the mold about 1/2-2/3 of the way up. If you start inserting your center cup and there isn’t enough cement you can always add more, but you can’t really deal with overflows. Start inserting your center cup. 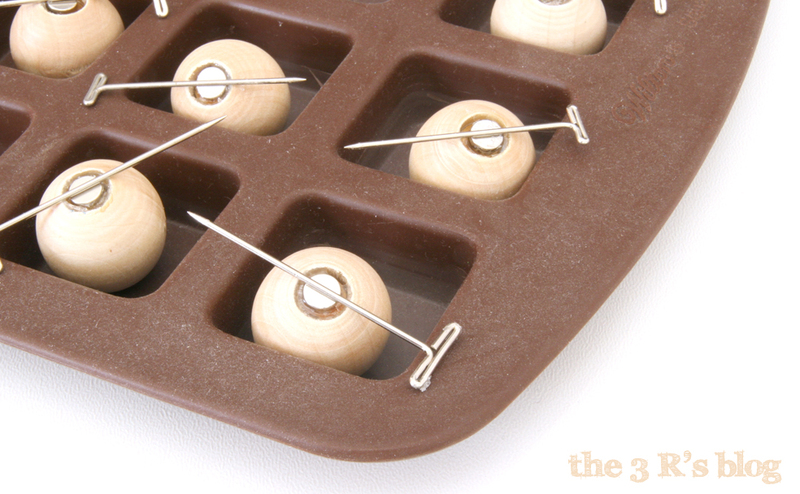 I found if you use a stack of them it helps them hold their shape, and gives you a larger area to hold. This step is where I learned the most as I made my planters. You want to beware of pushing down on your center cup and then letting it rise back towards the surface. 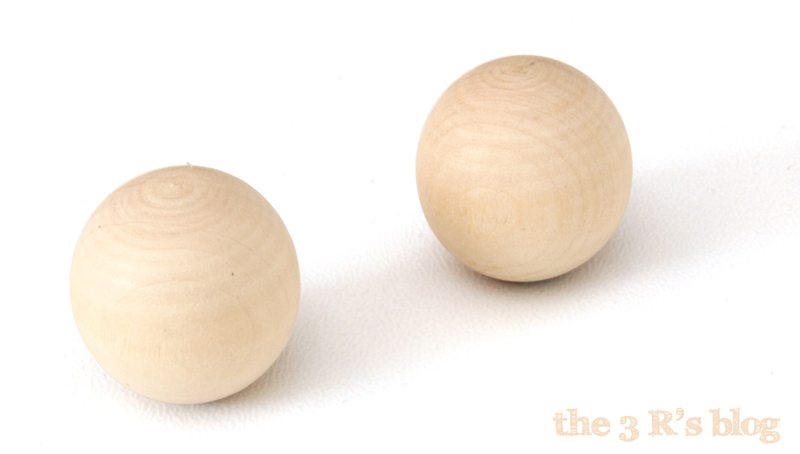 That will cause the cement to stick on the sides of the two cups, so your finished edge will have a sort of lip along the inner and outer edge, which just means more sanding and not as nice a finish. However if you only ever push down then the top surface of the cement will be flat or slightly convex, which is a much nicer edge. Here’s what happens to the wet cement when you let your center cup rise up after pushing it down, and what the final edge looks like with those lips, vs the nicer flat edge you didn’t need to sand. Here’s another step I tweaked. The original video I saw recommended taking duct tape and using it to tape the center cup down. However, this is where I found it is almost impossible to get it taped in place without it rising up a bit and giving you that ugly edge. Instead I used a bit of my cement to fill one of the smaller center cups, and make a cup shaped cement weight. I would drop that into the center cup in my stack, and it would hold the cup down. If you push your cup part of the way and then drop the weight in it will help it sink down slowly and evenly without rising back up and messing up your edge. If you plan on making more than one of these planters, I found it was a worth while step to take, making this center weight. But beware, you must make this weight first, so it is already hardened when you drop it in, and can therefore slip right out when you are done. When your cup has set, you can remove the center plastic cup by slipping the cement weight out, and then crumpling the cup towards the center while gently twisting and tugging. Now you just peel the outer cup off. First, remove the duct tape. Then cut the rolled plastic edge, and from there you can start peeling the cup away. You can do this as soon as your cement feels solid and is still warm to the touch, but beware it won’t have it’s full strength yet so be a bit careful. If you are using the 12oz cup you might want to give your planter an hour or two to set before you try to remove the mold, since the walls are thinner. I broke a few because I was too impatient. Sand any rough edges, or unsightly bumps with your sandpaper. Make sure your planter has had time to properly set first, I’d wait at least 24 hours to be safe. Then just add soil, your favorite plant, and enjoy! The cement is porous, so it will absorb water from your soil. You might find that you need to water your plants a lot. I found the plants that are happiest in the long term are super drought resistant plants like jades and other succulents which can survive their soil being sucked dry by the cement. It is one reason I didn’t bother trying to add drainage holes. If you are worried that the cement might get so wet it would damage the surface your planter is sitting on, you could try dipping the base of the planter into colorful latex paint. Wouldn’t a row of these dipped in bright rainbow colors look so cute along the windowsill of a children’s room?! Also as you can see from some of the past photos, when you use an 8oz cup inside a 16oz cup, you get an edge that is approximately 1/2 inch thick. But if you use the 12oz cup you get the nice thin edge you see here, which is closer to a 1/4 inch thick. It is still structurally sturdy, but you use less cement, the thinner edge is more elegant, and you have a much bigger interior space for your plants. You can also see that for the larger inside cup you do sacrifice a bit of the crumpled look, since your crumples can’t be as exaggerated. So you’ll have to decide what’s more important for you. I hope you have enjoyed this tutorial, I really loved how my planters came out, they are all lined up on my windowsill at work! If you give this project a try I’d love to see the results. And follow me on Instagram for more projects like this, @the3Rsblog. I know it has been a crazy long time since I’ve posted. Over a year I think, and I’m very sorry for that. But, I finally have some new craft projects to show you all! I promise I’ll have at least a couple new posts over the next few weeks, but first I thought I’d show you what I’ve been up to that has kept me too busy to post new projects here. 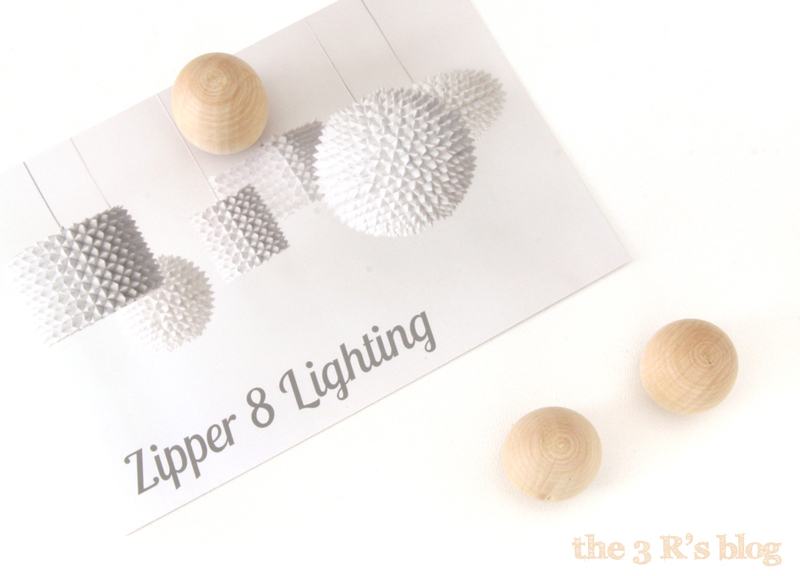 As many of you know I have my own lighting business, and while we started by just selling pendant lights (many of which were first born here), my partner and I eventually expanded to special event lighting. Specifically, paper flowers which are illuminated and could function as centerpieces and decor instead of traditional cut flowers. Two summers ago we decided that in order to capture our new vision, we wanted to completely rebrand of our business. So, Zipper 8 Lighting became Aster + Quail. I’ll add a P.S. to the end of this post with the story behind our new name, but for now I wanted to show you some of what we’ve been working on because I am just so proud of how it all looks! If you are curious to see more you can check them out on our website. But for now, I hope you enjoy! And come back tomorrow for a new craft post, involving a bit of a mess, some green leaves and a lot of fun. Asteria was the Titan goddess of shooting stars, sister of Leto, and mother of Hekate. After the fall of the Titans, Asteria was pursued by Zeus through the starry heavens. To escape his advances, Asteria turned herself into a quail and flew into the Aegean Sea where she became the Greek island of Delos. Asteria’s story of transformation and illumination is what we are all about! From a lonely old map at the back of the bookshelf, to an illuminated paper flower extravaganza – this is what we are most passionate about. Now that Fall is here (while according to the calendar it is still Summer, since I work in a school it most definitely feels like Fall) I thought it might be time to look forward to gift giving season. I have to say, I love gift giving. Whether it is during the holidays or for someone’s birthday, I love the hunt of figuring out exactly what is the perfect gift for each person in my life and searching for it, or even assembling a group of different items to make one larger gift. And that is exactly what this post is about. 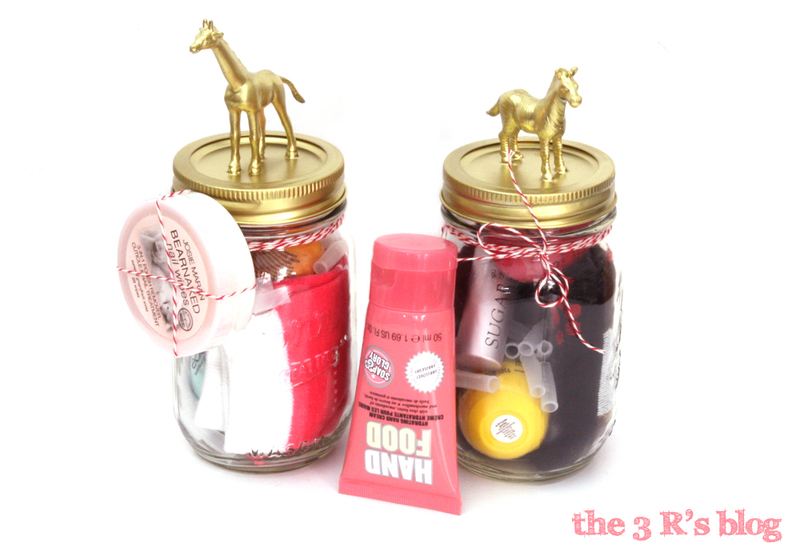 Last year one of my cousins suggested giving Mason Jar Gifts which had been so popular on Pinterest. And if you couldn’t already have guessed, this was right up my alley! For anyone who hasn’t seen these around the internet, the idea is to assemble a gift into a mason jar, usually bringing together small items that can all fit some theme, as well as physically fit inside the jar! That is the tricky part, because let me tell you finding items small enough to fit through the mouth of a standard jar is hard. I added the additional detail of attaching small plastic animals to the lids and spray painting them gold, for some added flair. This post isn’t going to be a traditional tutorial, because let’s face it I’ve posted a lot about painting small plastic animals recently, this is going to be more about giving you ideas of how you could create your own mason jar gifts. First, the items inside don’t necessarily have to be extravagant, it’s about the concept. I avoided the whole “cookie recipe in a jar” idea, though I did receive one of those in my gift exchange! But I have twin cousins who are in college so I thought some sort of comfort food gift would work, so I made them a “Winter College Survival Kit in a Jar”. First I found those adorable mason jars with handles, and I knitted them mason jar cozies. I’ve just realized I didn’t take any photos sadly, oops! But I did find that this small scale project was the perfect chance to practice new cable knit and braid stitches which turned out to be easier than I might have expected. Remember my whole “it’s hard to find items small enough” from the last paragraph, yea that was especially true with this gift, so much so that I ended up giving them two mason jars! They got the mugs with the cozies, stuffed with tea and hot chocolate packets, and I bought chalkboard mason jar lids which I decorated with a chalk pen that I then tied to the outside. I also included a bunch of glow bracelets that I found at Michaels in the dollar section. Then in the jar with the animal lids I included a cute pair of socks, various forms of lip balm and lip gloss, and I tied a larger beauty product I got at Sephora to the outside. Some things just wouldn’t fit in either jar. But the jar I was really the most pleased about was the one for my other cousin Scout. She had just graduated from college and had expressed interest in journalism, so I decided I wanted to make the jar a sort of “New Journalist/Recent College Grad in NYC Kit in a Jar.” Who says you have to name the theme anyway, right? 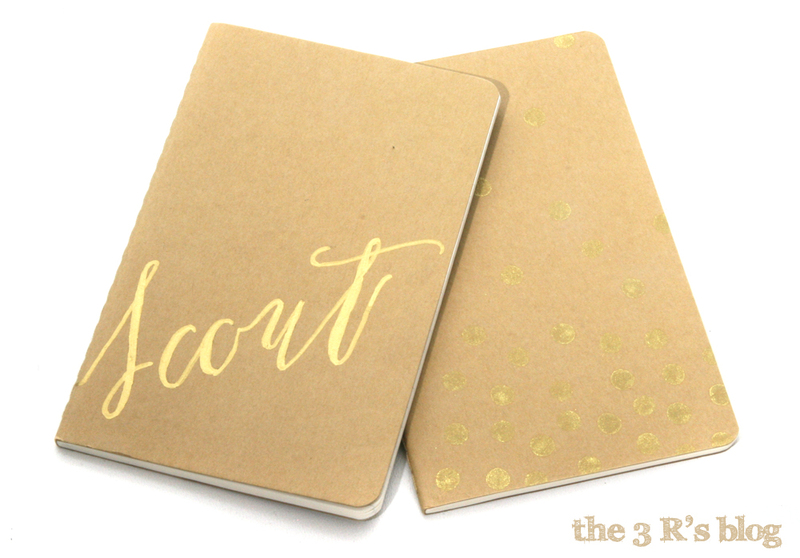 For Scout I got the idea to decorate a few small moleskins to make them more personal. I used a pencil eraser and gold stamp ink to create polkadots on one cover, and then I used a gold paint pen to paint her name in script on the other. I found the fun font online and then printed it out and transferred it with pencil to the cover to copy. I would not have been able to freehand that. The hardest part was finding a jar that would fit the moleskins, even though they were super small. Finally I found one, I think it was possibly one of the largest mason jars you can find! 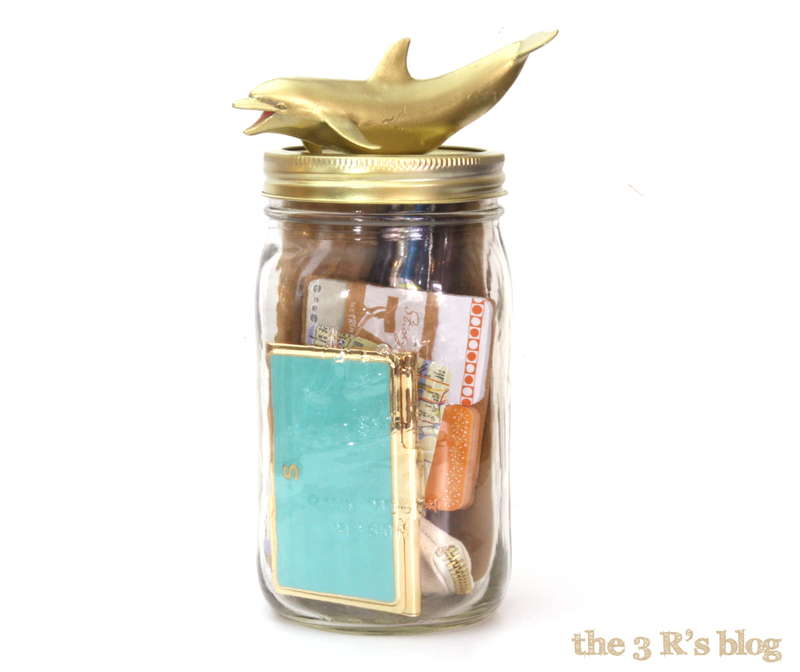 For the other items I tried to find a few things that were special and popped, like the gorgeous turquoise Kate Spade business card holder with the letter S on it. 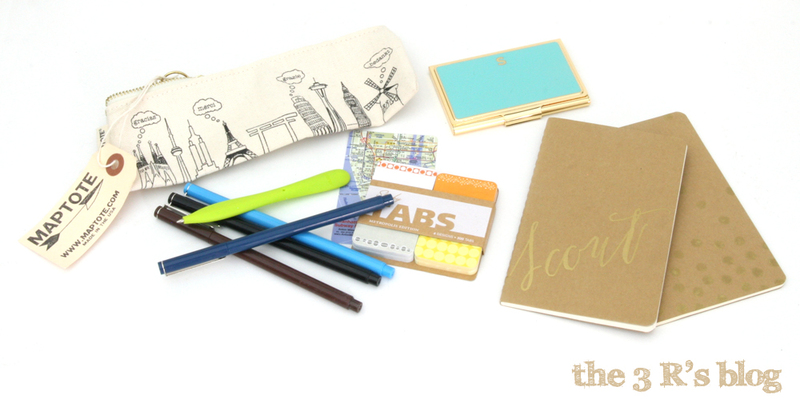 Other things are just fun and fill the jar, like the assortment of pens. Not everything has to be expensive, I found some really cute little sticky note tabs at staples that were totally on theme and also cheap. It’s about the items all together, not each one individually. The one thing I struggled with was the animal for the top of her jar. Scout used to say she wanted to be a marine biologist, so when I saw the dolphin I thought it would be perfect. And visually, it totally is. However, I didn’t think about how it was larger than the lid, so you couldn’t get the ring part of the lid off over the top flat piece, once the dolphin was attached. Ideally, I would simply have glued the lid together, glued the dolphin on and then spray painted. But this is when I learned that super glue is not like hot glue, in pretty much all ways, and I totally botched my first attempt at gluing the lid together because I added way too much glue and it wouldn’t dry. So I had to do it again, and then at that point I’d already spray painted it once so I didn’t want to spray the dolphin again so I figured, no big deal I’ll just glue it on after, right? Wrong! The dolphin would not stick. So, do whatever you need to do to make your jar work, but make sure you glue your animals on BEFORE you paint, not after. It still looked awesome though! Even if the dolphin fell off 30 seconds after I gave her the gift. 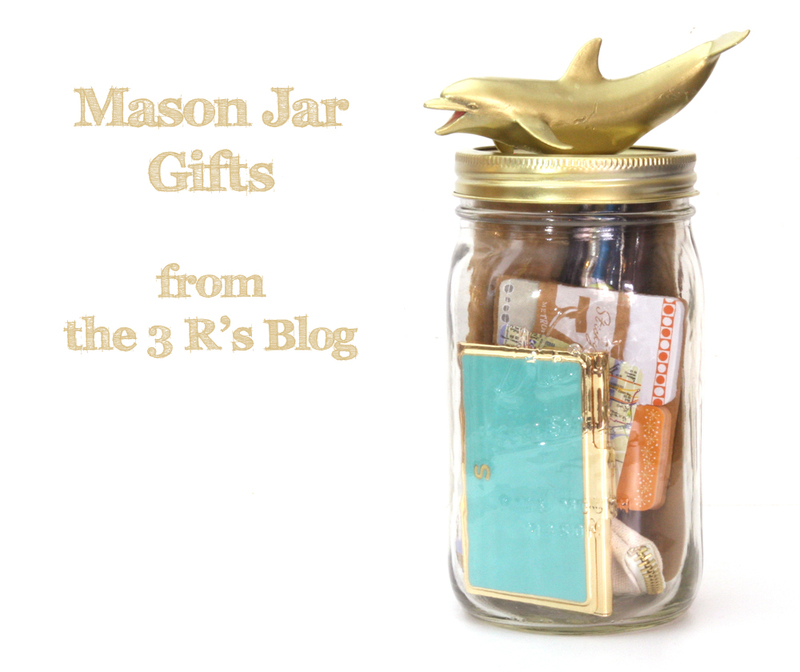 So, the next time you need to give a gift think about using a mason jar because not only are they cute, they are also then functional, and if my gifts haven’t given you any ideas I know you can find a million different sites for more inspiration on Pinterest! Most importantly this holiday season try not to get stressed about finding gifts, try to think of it more like a treasure hunt with the treasure being a gift that the recipient enjoys unwrapping as much as you enjoyed assembling it.